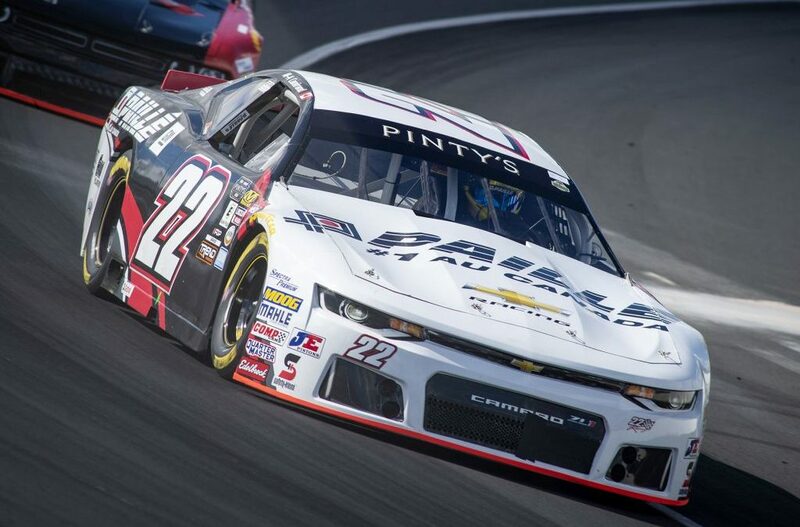 Hagersville, ON, September 30, 2018 – Marc-Antoine Camirand concluded his 2018 season with a seventh-place finish, on Saturday night, as the NASCAR Pinty’s season finale took place at Jukasa Motor Speedway, near Hamilton, ON, for the Pinty’s Fall Brawl. Camirand was hoping for a strong outing, for the last race of the 2018 season. However, his GM Paillé n°22 Chevrolet Camaro was not as fast as he expected. “During the first practice, I felt that my car was not as powerful as usual when it reached high engine revolutions, and it continued for most of the day. I have never been as fast as the leaders,” he told. Camirand qualified the GM Paillé n°22 Chevrolet Camaro in 10th place, and made his way to the top five during the 200-lap race. “I gained a few spots, and even though I wasn’t fast enough to fight with the leaders, I thought I could finish in the top five,” said Camirand. The driver from St-Léonard-d’Aston was unfortunately caught in the outside lane after the last restart, and lost some positions. “A few drivers, including me, had nothing to lose and we fought hard to achieve the best result in the last 10 laps. We traded some paint. Unfortunately, I was caught outside after the restart, and I finally scored a seventh-place finish,” explained the driver. Camirand is overall satisfied of his 2018 season, and he finally claims the 6th place in the drivers’ standings. “This season, I achieved my first career win and we had some great performances, despite the fact that we had some bad luck that was costly in the championship. I have an incredible partner, GM Paillé, that has been very supportive during the whole season. Now we are looking forward to the 2019 season, and we will work hard to prepare for it,” Camirand concluded. The NASCAR Pinty’s Series season in review will air on Saturday Dec. 1st at 12 noon on TSN.